MOST Tanzanians under the age of 35 do not know the basis of friendship between China and Tanzania. Most of them know the China that is misinterpreted by some sections of the media and are unaware of the tremendous support that China has given to Tanzania and other African nations. The little understanding in terms of aid and close relationship between Tanzania and China is largely influenced by the absence of civil society agency that tells Tanzanians about China's aid to Tanzania. These aids have been in the categories of infrastructure building, education, health, tourism, agriculture, etc. China has made great contributions to promoting our country's economy through investment, assistance and construction of various development projects. 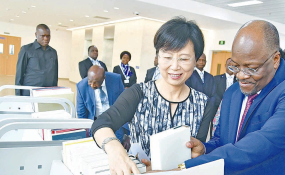 The latest example of China's contribution to Tanzania is the biggest university library in sub-Saharan Africa - the University of Dar es Salaam Library. Covering an area of 4.7 hectares and a building area of 20,000 square metres, the UDSM Library can store 800,000 books and accommodate 2,100 people at the same time. It also has a lecture hall with a capacity of 600 seats. Completed in this July, this state-of-the-art library was just inaugurated yesterday with the presence of H.E. Dr John Pombe Magufuli, President of Tanzania and H.E. Ms Wang Ke, Ambassador of China to Tanzania, Hon. Prof Joyce Ndalichako, Minister for Education, Science and Technology of Tanzania and other senior government officials as well as UDSM leaders. During the inauguration, President Magufuli praised China as a true friend of Tanzania, and spoke highly of China's aid to Tanzania, which has no conditions attached. He also said that the new library will make students to learn better. The relationship between Tanzania and China began in the 1960s when these two countries initiated diplomatic relations on 9 December 1961. China went shoulder to shoulder with Tanzania and helped us in many aspects from political, military and development levels. China has been providing various development services and has continued to help Tanzania in various sectors, all of which aim at developing and promoting political and economic development of Tanzania. The Chinese Embassy has initiated the internship programme, which focuses on fostering talents for the future development of Tanzania. The contractor of the UDSM Library project had been conducting an all-round joint venture with UDSM with a view to providing more internship opportunities for college students in architecture, civil engineering and other related fields. Each student was assigned to Chinese instructor of which 20 students underwent a two month internship in the Chinese aided library construction for UDSM. You and I can imagine a number of benefits Tanzanian students received during their internships. Some of these include but not limited to one-to-one student-instructor relations, access to modern construction and engineering tools, receiving first-hand construction and engineering information as well as learning multiple skills in engineering and construction which in the end will help them develop their careers, and to take on multitasks in both engineering and construction. Apart from the construction of this library building, Tanzania has been receiving a lot of support in recent years. One of China's greatest support in recent years is the great and modern International Conference Centre named after the first President and founding Father of the Tanzania - Julius Nyerere International Convention Centre. This conference centre is one of the biggest and modern conference centres in Africa and many international conferences are held there. In addition, China has built a modern building for the Ministry of Foreign Affairs and East African Cooperation, the building was completed in 2018. All these buildings are located at the junction of avenue garden and Shaaban Roberts street of Dar es Salaam. China also constructed the Jakaya Kikwete Cardiac Surgery Institute in Muhimbili area. This institution has greatly helped many Tanzanians, especially low income earners, to access heart surgery and treatment, a privilege that used to be for the prestigious few. But it has also helped eliminate the cost of sending people out of the country for cardiac related treatment. This building is modern and has modern and affordable equipment. China still plans to build a huge Cardiac Treatment and Training Centre on the outskirts of Dar es Salaam. This construction will help make it easier for Tanzanians to get cardiac related treatment services within minimal time and procedure. China has also been sending expert specialists to assist with surgical operations and treat various diseases in different hospitals. China also provided support for the construction of a research centres at the Dakawa Centre of Agriculture in 2015 with the aim to promote modern farming in Tanzania. China has built us a National Stadium with the capacity of 60,000 people. Construction of this stadium cost China a total of $40 million. This stadium has brought us great honour to Tanzanians and has made Tanzania one of the few African countries with a great and modern sports stadium. The donations offered by China to Tanzania basically are too many, however, China continues with its strategies to support the African nations. China has committed to facilitating the construction of 5 universities of transportation in Africa, one of which is to be constructed in the eastern and central African countries whereby Tanzania was given the largest opportunity if we would have been smart enough to "go get" the opportunity! In order to ensure that the promise is fulfilled, China has planned to convert the National Institute of Transport (NIT) college into a major university of transport in East and Central Africa. The college aims to provide young East African people with expertise to help the country with qualified technical knowledge to manage modern infrastructure after they have completed their studies. The construction of this college will also help reduce the costs of sending Tanzanians to study abroad, and will also help increase the number of professionals who will manage all technical activities, especially in the modern electrical infrastructure built in eastern Africa such as railways, road infrastructure, marine and air transport. This is a clear evidence of how China is a true partner to African nations and intends to eliminate poverty. Apart from the plan to build a transportation university, China plans to build a Tanzania Vocational Training Centre in Kagera Region. The contract to construct the Vocational Training institute was signed on 26th November 2018. This technical training centre is expected to cost more than $10 million. The centre will be built in two different areas where the first pilot will be able to accommodate 400 students and the second one will take up 400 students as well. Once ready the vocational institute will be able to attract 800 students. China also intends to build a huge and modern Geopark in the Ngorongoro Park. The construction of this Geopark, aims to help increase more tourists that will invest more in our nation. After completion of the construction of all infrastructures, a strategy will be set to market all tourist attractions especially the Ngorongoro crater considering that one of the largest tourist attractions in the world. This is still China's initiative to integrate Tanzania and Africa as a whole.